you become fragrant like the rose. you become graceful like the angel. your joy leads the way. You’ll be the kingdom and the king. You’ll be paradise and the guardian angel. You’ll be infidelity, and you’ll be faith. “You are the lion and the deer. You are bold, fierce, and vibrant, and you are silent, sweet and gentle. If I should come to you in arrogance you roar at me until my falsehood quakes in fear, so terrified it gives up the game and love’s conquest happens yet again! If I should come to you in surrendered adoration, open to whatever you may wish, you are so gentle with me. Like a deer, you offer me nothing to fear or resist so that I too become sweet and gentle, longing to submit to your tender ministrations. “Hello my old friend. Do you remember me? We are the oldest of friends; ancient soul mates we are, acquainted over many lifetimes past and through many lessons earned together in the school of love. So here we meet again, in this advance spiritual training of the human experience, with the earth as our classroom. The moment is upon us to leave behind what we have once known, and to open up to the great mystery of life again. Our souls leapt from the divine oneness through the river of forgetfulness and now dive into a body and a life. What journey that leap begins! Let us embark on this studious adventure together. Let us honour the tiger and the lamb within each other, the lion and the deer. I can witness in you both the raging warrior who fights with the unbreakable honour, and the healer who brings together those things torn apart. Of course! For are we not all things? Are we not human and angel, animal and spirit? Are we not heaven and earth? Are we not divine? And in being divine, being all things, all things are divine. So we are here together in the school of love; not for the soul who still adheres to preference instead of curiosity, not for the soul who craves comfort instead of devotion to divine adventure. We must be like lovers, you and I, if we are to take these lessons. We must be willing to become mad with passion, crazy enough to chase the Great Beloved, even if it means forgetting who we are for a time to have the sacred delight of rediscovery, breaking some rules and looking like fools. Well what could be greater than becoming a fool for love? That will do for us,; that will do well. Let us be fools for love, together. So shall we become study mates? We’ll recognize each other, even in all of our varied garbs, bright or sombre, wild or gentle. We’ll become the most enthusiastic students in the school of love, urging each other on to ever greater feats of passion and devotion. How we shall outdo each other in grand gestures and our unwavering commitment. 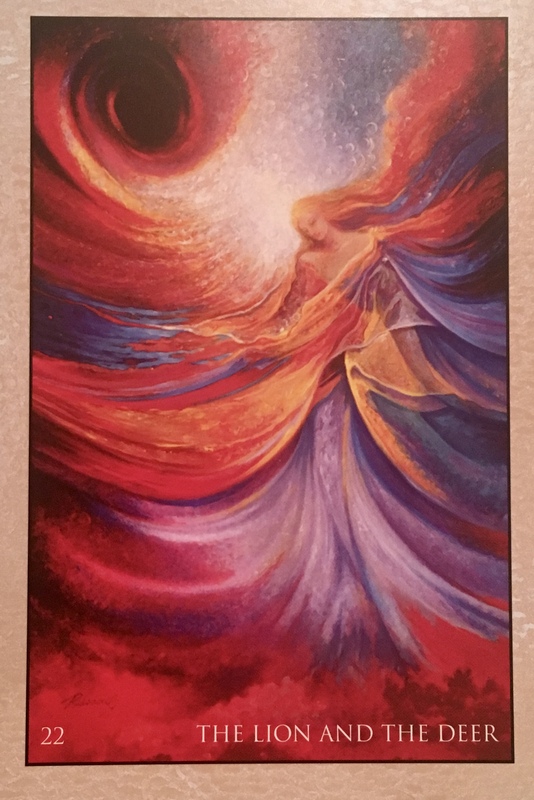 This oracle brings you a special message: you are rediscovering a part of yourself that has been lost or submerged underneath ‘more practical’ concerns. Of course, if practicality is about survival then learning to be your true self is most essential and practical! All other paths lead to death of the soul! You are asked to bear the chaos of this rediscovery. It may be that talents from this or other lifetimes are reawakened and cause you some discomfort at first, even though they will ultimately bring joy and greater fulfillment. The discomfort may be around how those talents are best expressed, about overcoming shame, guilt, doubt or other judgments. It may even be about who you are, if you now admit your talent or other emerging personality traits. Perhaps what is being unearthed in you now is darker – your sacred rage, refusal to accept disrespect in your life, your inability to tolerate lies and deceptions. Well then, you are the lion, and the deer. That is nature. There is to be both in the world. You are not becoming contradictory or hypocritical. You are becoming whole. The guidance this oracle brings you is that you shall prosper most now if you are willing to unbecome what you have believed yourself to be. It was never really true anyway, that view. It was partial at best; and just a view, an identity, not a genuine reality. Some of your previous sense of self shall likely come with this transition into the fuller experience of your being, and some of that previous identity shall be shed as far too limiting. It just won’t feel true for you anymore, if it ever did. Any crisis or confusion this brings you shall be temporary fuel to ignite the divine fires within. They simmer into life, cooling you from within, bringing all of your flavours, spicy and sweet, bitter and sour, into perfect balance so that your being, your presence, becomes an exquisite dish served up as a divine feast. You shall become nourishment for the world, in perfect balance. Your being will hold all, for it holds all within it. It will deny nothing, and become a tonic to feed every taste, every appetite, every hunger and every deficiency. What an extraordinary sublime meal you shall be! How your presence shall nourish the world! As we come together collectively as a whole we also integrate the energies on an individual basis. Each one of us will go through a rite of passage; to some it will be earth shattering and life changing, things will never be the same. For others it will be a subtle shift and will only really fully show later when they realize that they are no longer the same person they once were. And yet as we unravel the social conditioning, the belief systems, the limiting thought patterns and the old habits, finally we find our strength and freedom. Now we can be who we truly are. There is no attachment to the past here, only fond memories of life experiences and lessons learned. Pain is nurtured and healed. The thousand petaled lotus is blooming and blooming; we are opening up in ways we never even thought possible. DNA is shifting, opening, activating. Body, mind and spirit together are ascending. Everything is transforming; altering. Truth leads the way. There is absolutely no room for deception, it is too dense and heavy, it cannot survive the high vibrational reality. Higher hearts are opening, chakras and energy centers are aligning. Everything looks and feels different. Everything finally starts to make sense. And no one is left behind as we travel up through the higher realms, they may be slower but they too will get there. The awakening is well underway. This is one of the most beautiful and moving posts I’ve seen yet. Thank you Dee. I hope these words reach the many who need to see them.